Modern hair transplantation specialists can offer comprehensive hair restoration services. That is, the qualified hair restoration specialist is not limited to treating the typical pattern hair loss patient, but can offer alternative hair transplantation that includes Facial Aesthetic Hair Transplantation. Facial Aesthetic Hair Transplantation includes the reconstruction or restoration of eyebrows, eyelashes, temporal peaks, sideburns, moustache and beard. One of the advances that make this all possible is the use of the binocular microscope to create one and two hair follicular unit grafts. These single and two hair follicles are the building blocks that permit the creation of very natural appearing transplanted hairs that show no visible scars. Thus, this permits the creation of hair artwork. Armed with these follicular units we can employ very small blades to create sites. These sites can be placed very close together, allowing the creation of hair density with only one pass. We can control the angle of the sites created. We employ very acute angling in the creation of eyebrows, temporal peaks, and facial hair, so the transplanted hair lies down. Before photo showing the china pencil drawing of the left temporal peak and side burn which is to be transplanted. Sites were created using a 1.25mm blade at a very acute angle. 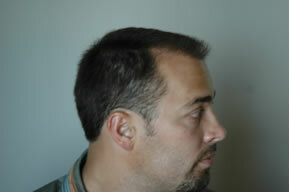 After photo showing left cosmetic sideburn enhancement detail. 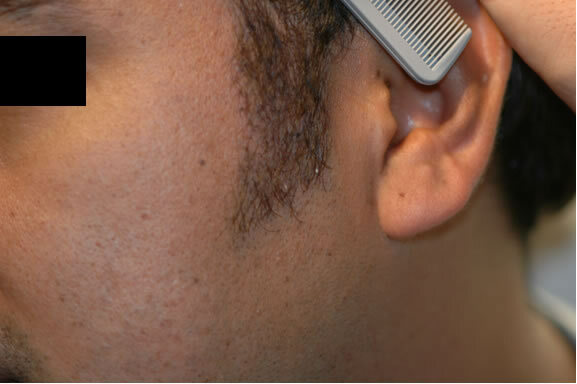 Note that the hairs are growing flushed to the skin. Also note that this marked improvement is only 2 weeks after the procedure! Before photo with the right temporal peak which is to be restored. Note china pencil drawing of the hairline and right temporal peak to be restored. A natural appearing right temporal peak obtained only four months after the procedure adds definition to the face. This excellent result serves the important function of framing the side of the face. Note the much-rejuvenated patient sporting a crew cut. 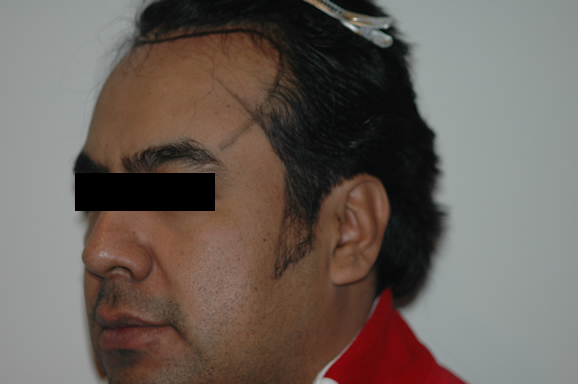 Immediate improvement in the reconstructed eyebrow obtained one week after the procedure by leaving the hair long in the transplanted follicular units. Note that the surface epithelium of the follicular unit grafts is now flaking off. The advances in modern hair restoration surgery are forging the advancement of hair artwork; hence we can embellish and rejuvenate our patients with suitable improvements to their faces that include eyebrows, eyelashes, temporal peaks and facial hair. Not only are the improvements groundbreaking, they are also very timely.